The Oconee County Board of Commissioners on Jan. 27 decided to move forward with the study of the feasibility of a local Transfer of Development Rights program, but it would be hard for readers of the local newspapers to know that. Under the headline “Commissioners say no to TDR funding” The Oconee Enterprise reported in its Jan. 29 edition that the “board said, ‘Whoa’” to a request that it hire a consultant to help move the TDR program along. The Oconee Leader did not report on the commission meeting at all in its Jan. 29 edition. What the Board did at its meeting on Jan. 27, as I reported on my blog on Jan. 28, was vote to issue a request for proposals (RFP) for a consultant who would study how a TDR program could be implemented in the county. The Board did not vote to spend the money on the consultant. The usual procedure is to get the bids and make a decision about moving forward based on those bids. The County put the video of the meeting on its Vimeo site on Jan. 31. I had made an audio recording of the meeting, and I transcribed it the day the Enterprise and Banner-Herald stories appeared to make sure what I had written was correct. The transcription shows that the conversation took several turns, with the Commissioners initially quite cautious about how to respond to the unanimous recommendation of the 16-member citizen Committee. Once Finance Director Jeff Benko told them there was money in the budget for the study, they became more positive. According to the traditions of journalism, words that appear within quotation marks in a news story are supposed to be the exact words as spoken by the person to whom they are attributed. The transcription shows, of course, that no one said “Whoa” at the meeting, and perhaps the Enterprise was simply taking a little license at that point. The transcription also shows that the Board did not vote to “come up with the scope of the work,” as the paper reported, though that is pretty close to the final language of the motion. Commissioner John Daniell said that, and Commissioner Chuck Horton agreed. All they were stating is standard procedure. The Enterprise reporter, publisher Vinnie Williams, was sitting in the second row at the meeting, just in front of me. Williams, may or may not have written the headline over the story, which is clearly wrong. The transcription does show that Williams took considerable liberty in presentation of the direct quotes in the story. The paper also reported that the Transfer of Development Rights Study Committee has 10 members. I confirmed through a telephone conversation on Jan. 30 with Wayne Provost, Strategic and Long-Range Planning director, that none of the 16 members originally appointed to the committee and listed on the county’s web site had resigned. The county’s free circulation weekly, the Leader, has a closing deadline for stories that is nearly a week before the paper appears in mailboxes. It rarely covers meetings as a result. The lead front-page news story in the Leader’s Jan. 29 edition was about the appointment of John Jackson as superintendent of Oconee County schools. The Banner-Herald reported that story in its edition of Jan. 23. The story about the BOC vote on the TDR report in the Banner-Herald on Jan. 29 was only three paragraphs long and appeared beneath the financial markets reports in the paper on page A6. The paper’s Oconee County reporter, Adam Thompson, did not attend the Jan. 27 meeting. The story quotes Commissioner Jim Luke as the source of its information. As the transcript shows, Luke was initially very cautious about going forward with the TDR study, but he shifted and made one of the strongest statements in favor of the motion. “I think I’m going to change my mind and suggest that we just go on and ask for a quote on services and plan on moving forward unless we discover something in that process that we don’t like,” he said. The vote to do just that was approved unanimously. A TDR program, if enacted, would establish development rights for areas of the county that are not now developed and allow the owners of those rights to sell them to developers in other designated areas of the county. When the owners sell their development rights, they would have to put a restrictive clause on their property stating that it could not be developed in the future. The developers who purchase the development rights from the "sending" areas would be able to use them in the "receiving" areas for such things as more intensive development, priority access to water and sewage capacity or development prohibited by current zoning regulations in the county. News coverage of the county in local newspapers is not likely to get much better in this economic crisis. 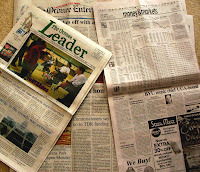 The Banner-Herald reported on Jan. 28 that it is cutting 15 jobs, including from the newsroom. Reporter Thompson will be covering Madison County as well as Oconee County as a result. The good news is that every citizen can be a journalist, and the citizen journalism move around the country is becoming quite strong. The Knight Citizen News Network has just releasee a handbook to help citizen journalists know how to gain access to government records and meetings. It is just one of many resources on the site available to citizens who wish to be journalists. Oconee County already has quite a number of citizen journalists. I’ve prepared this list of those I know of.